It’s been a year since the sad news about Peter Steele’s passing hit the Metal Republic and I have to say that it seemed to be the kick off to a number of other bad turns of events. 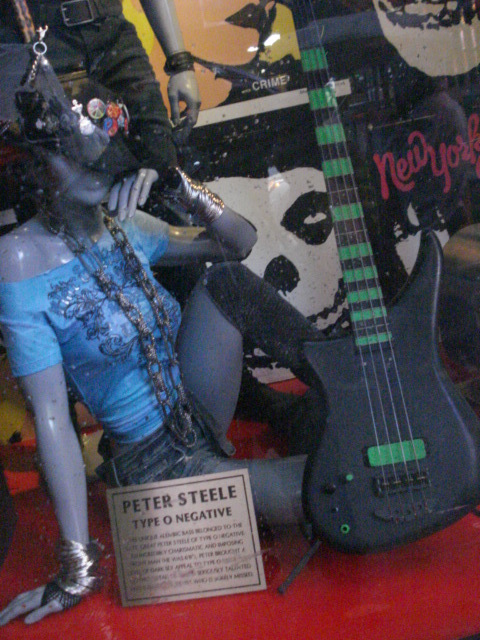 While none of the musical deaths that preceded Peter’s were any less important, his own passing set off a shock wave in the underground Metal scene where Type O Negative were kings and really left a lot of fans shocked and dismayed. The band was obviously over and done with now that the principal song writer was dead and while members Hickey and Kelly would continue on with their side project Seventh Void, the chapter on Type O Negative was one that had apparently closed in the book of Metal music history. Research had found that no unreleased music was left lying around, but perhaps some historically relevant video would surface for the fans to enjoy. A little over a month after Peter had passed away the world would lose the mighty Ronnie James Dio but thoughts about his passing are better discussed in the narrative that is dedicated to his illustrious career. When Peter was gone and the word was confirmed as truth instead of another cruel jest; a memorial posting was made in the Official PiercingMetal.com blog. With the First Anniversary of his passing being today I wanted to revisit those thoughts which can be read by clicking the photo above. Comments about The Man are continually welcome by those who enjoyed his music as much as we did but we ask that you please leave them on the original memorial posting as opposed to here for greater impact. We miss ya Peter and hope you are rocking with the likes of Hendrix, Bonham and many, many more. Peter’s Alembic bass guitar is now a part of Hard Rock Cafe historic pieces and at the time of this first anniversary could be viewed in one of the establishments windows. When I learned that it was at this location I made sure to snap a couple of photos for proper use in these thoughts. The words they showcased seemed to hit the nail on the head for me, so I was happy with how they were presented. Don’t mind any spots on the image as there was a torrential rainstorm happening around me when I did this. 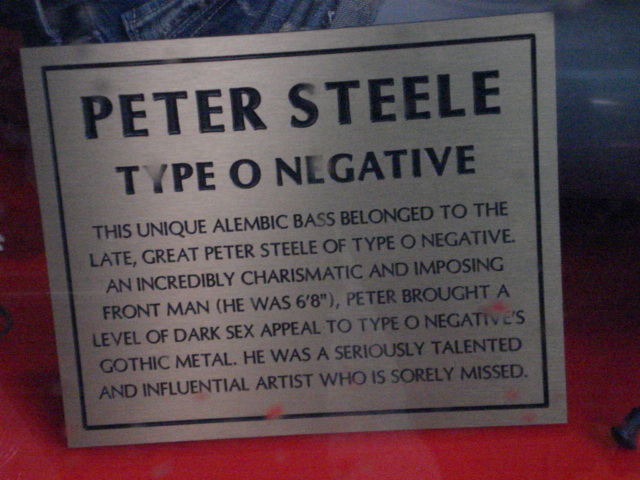 Kudos to the Hard Rock Cafe brand for realizing that Peter Steele and Type O Negative are worthy of inclusion among your legendary ranks of artifacts. While the Rock and Roll Hall of Fame will likely remain forever clueless and leave a band like this one out of its “honors”, its great to see that some others actually understand and appreciate such a vital musician. I thank you as a decades deep fan of Steele’s music. Note: Please know that the means to comment on this post have been turned off and we ask that any reflection thoughts or toasts about Peter Steele that you wish to share be left on our first Memorial posting that can be found HERE. Thank you. That might be a bass Peter owned, but it’s NOT the same one he played live, that’s for sure. Look at all the shots of him and his bass on stage. 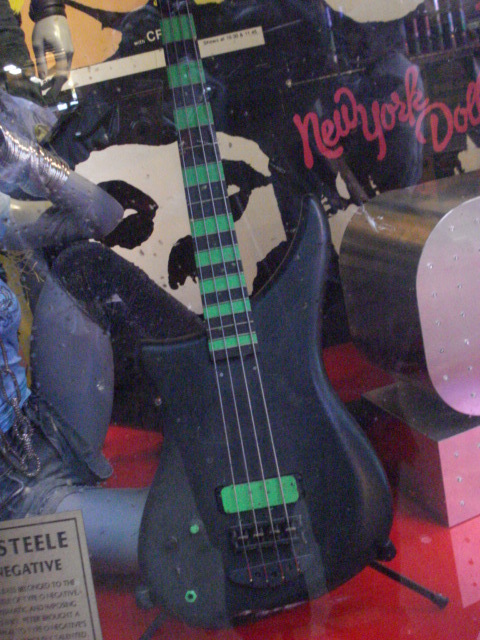 The lower green frets on the one he plays extends on to the body of the bass. Hell, the body of the one he plays is completely opposite of the one on display, and the display bass looks like the strings are strung in reverse order, with the low string furthest down. There’s no diamond plate pick guard surrounding the knobs on the display bass. The entire components which make up the lower half of the bass are different, from the bridge to the truss rod access hole. I was just there yesterday & saw the bass upclose. It’s definitely not a bass Pete played. It is indeed a left handed bass as stated above, and when you look up close you can see that it is strung for a lefty, so no way did Pete ever play it. The paint job is of the same quality (ie: non-professional) as the ones he played, and there’s some damage to the headstock. Like a few nail holes or something at the very top. So, it was great to see Pete get acknowledged this way, but the guitar itself is a definite replica, and a bad one at that. Thats definitely a left handed bass, Petes Alembic was a spoiler, this one is not. its definitely an Alembic thats for sure, not sure wich model, but it wasnt Petes.